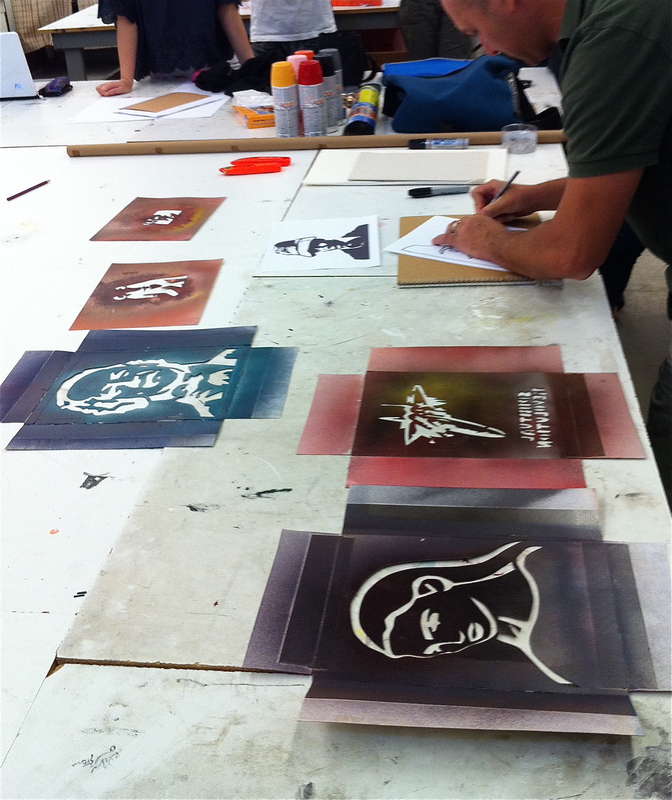 I developed and taught a new course at LIU’s CW Post campus in Brookville NY this past summer. 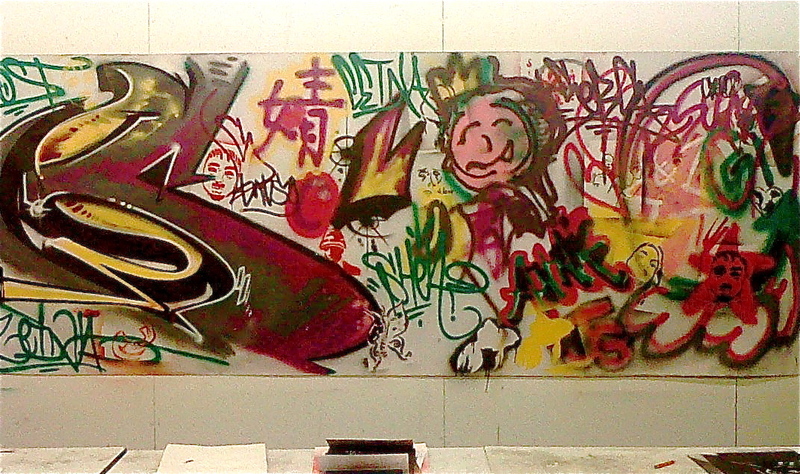 I titled the course “The History & Emergence of Street Art & Graffiti”. I knew in advance that the class would fill to maximum student capacity, and indeed it did shortly after the course became available. I am grateful that the art department saw the value in the content of this course, and how it would inspire and impact the students. I wanted to thank all of the students, guest lecturers, friends and supporters who helped make this possible. I continue to get great feedback and positive support about the course. I am happy to announce that the course will run again this July 2012 at LIU’s CW Post campus, in Brookville NY, as well as during the month of June at CUNY York College in Jamaica, NY. I will soon be making announcements about set dates, as well as how and where you can register. Thanks to extensive documentation provided by the students, I will continue to add more photos and content as the course continues its development. 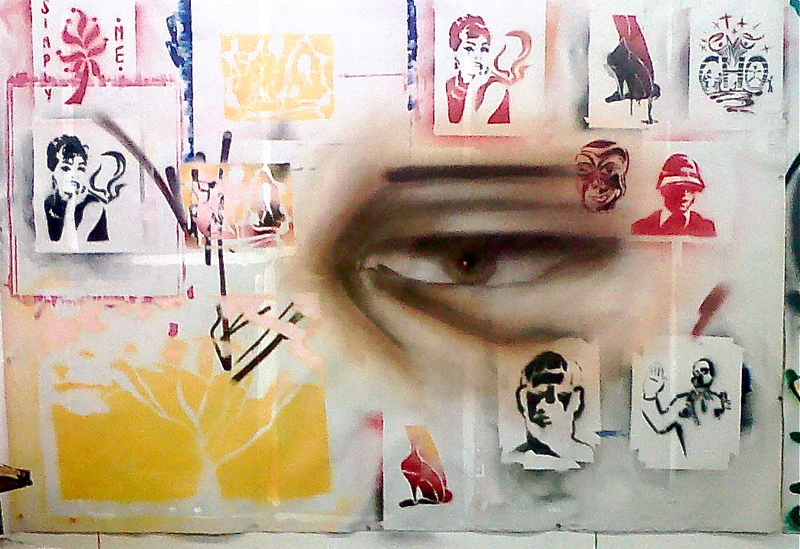 Course Description:: This course explores the emergence of street art and graffiti as a contemporary art movement. The course traces the history through its past and present artistic developments on a technical, stylistic, and cultural level. Students will draw from its New York roots and examine its growth in popularity, both nationally and internationally, from the streets to the gallery and museum walls. The course pays particular attention to the artists and writers from New York City. Students will use their written and oral communication skills to demonstrate what they have learned in various formats. The course includes a guided NYC walking tour and guest lectures. Born on Staten Island in 1981, I began studying painting as a young kid at a local art league. Since then, painting has remained an integral part of my life. With my work, I look to capture the feel of something made long ago, be it characters with old-fashioned appearances or objects with Old World designs. I depict ideas in my paintings in a representational and faithful manner, yet convey them visually with a whimsical touch. Borrowing from techniques of the Northern Renaissance, I like to mix my own pigments with oil and paint by building up multiple layers. My thought process for painting, however, is less traditional and very much informed by my background in street art. I aim to make surreal impressions, with characters whose square heads are on the one hand very unreal, yet whose facial features are eerily familiar. I enjoy depicting scenes showing the viewer fictitious landscapes of an Old World interspersed with contemporary qualities. Nature also plays an important role in my work. I show animals in a more traditional manner, painting them with realistic colors and textures. Often I’ll couple animals with imaginary devices that they control. Whether on a panel in the studio or on a wall in a city, through my work I try to convey a playful world of mixed inspirations. 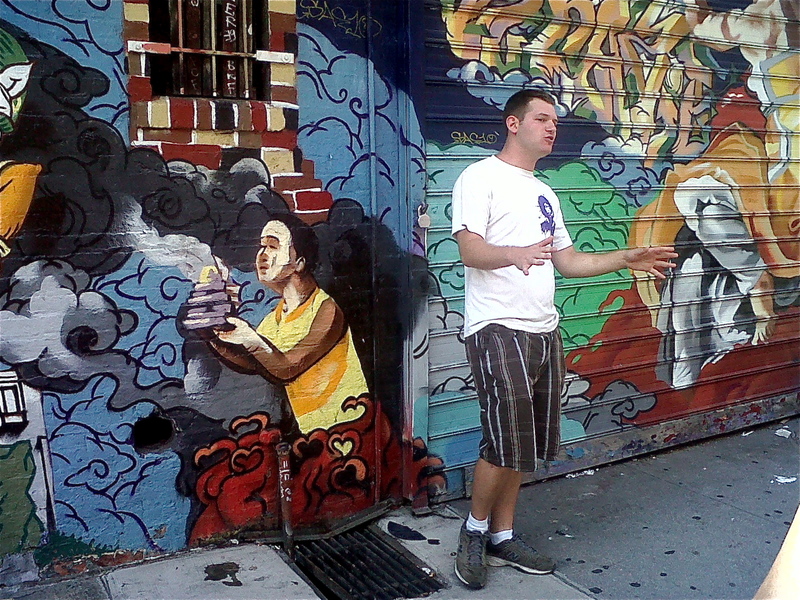 Luna Park is a Brooklyn-based street art and graffiti enthusiast, photographer and curator. She is co-founder of and regular contributor to The Street Spot blog. Since 2005, she has spent her free time exploring NYC’s decaying, post-industrial fringes in search of beauty in unexpected locations. She is passionate about urban art and supportive of all creative endeavors to redefine public space. Her photographs have been exhibited in New York and Los Angeles and have been featured in leading urban art books, including several artists’ monographs and the upcoming Graffiti 365. Together with Billi Kid, she co-curated Eames Inspiration in 2010 and The Great Outdoors in 2009. In 2011, she presented her observations on street art at the New York Public Library. In the 70s, John Fekner was ‘anonymously known’ for over three hundred environmental/conceptual works consisting of dates, words, and symbols spray painted throughout the five boroughs of New York. The “Warning Signs” project focused on pointing out hazardous conditions that dominated New York City and its environs in the 1970s. In the spring of 1977, Fekner created word-signs using hand cut cardboard stencils and spray paint. He began a relentless crusade concerned with social and environmental issues. Starting in the industrial streets of Queens and the East River bridges, and later on to the South Bronx in 1980, his messages were seen in areas that were desperately in need of construction, demolition or reconstruction. By labeling structures and emphasizing problems, the objective was to call attention to the accumulated squalor by urging city officials, agencies and local communities to be more responsible and take action. Was born and raised in Bushwick, Brooklyn in the early 1990’s. Sebs got into graffiti at the age of 12 through exposure from other neighborhood kids. He got into trouble and quickly moved out of Brooklyn with his family. The circumstances then lead him to pursue art as a career. He learned how to airbrush, watercolor, oil paint and tattoo. Sebs currently holds a NY State K-12 art education license. 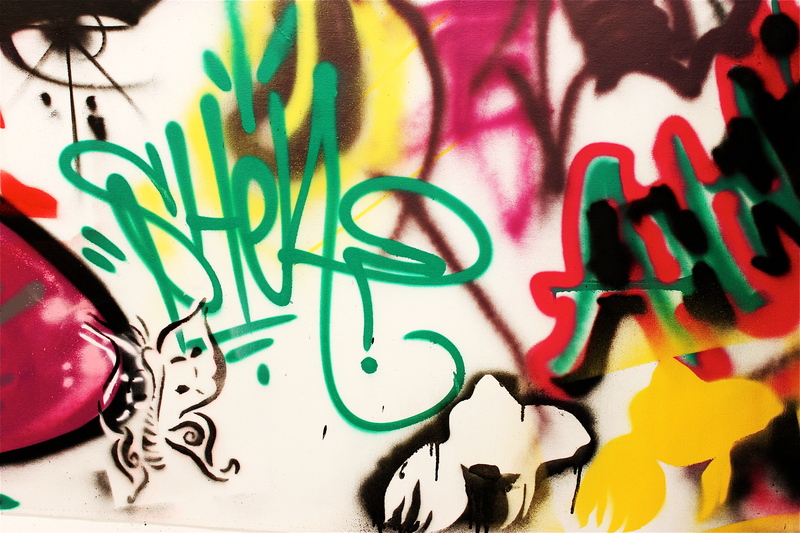 He continues to passionately produce graffiti art and exhibit in group shows. Sebs is currently creating a variety of works that capture his interest, and overall production enjoyment. Sebs is also a working tattoo artist. Sebs rocked an aerosol demo for the course after his presentation. 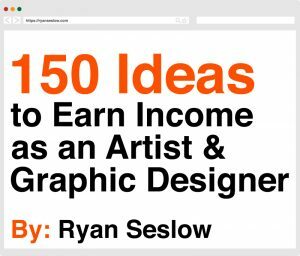 Ryan Seslow – is an artist living and working in NY. Seslow is a professor of Fine Art teaching various studio art courses simultaneously between 4 colleges in NY. Seslow has been involved in graffiti and street art for over 15 years.